Marriage God's Way: How Big Is Your God? Based on statistics I would have to believe that this statement would apply to a number of Christian marriages. A Christian marriage is to first and foremost bring glory to God (see blog Is Your Marriage Normal?). It is to mirror the relationship between the Father and Son, between Christ and His bride the church. I think it is safe to say that IF that were to describe our marriages, Christian couples would be experiencing a true sense of joy. 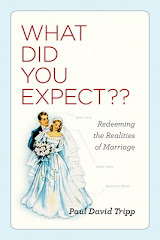 Divorce, unhappiness and dissatisfaction would never be associated with a Christian marriage. That does not mean that everything is perfect, that there are no difficulties or areas of conflict. It does mean that as couples we would exude an intangible quality that would attract those couples who are non-Christian to want what we have. All this is to say, have we as Christians become satisfied with a marriage that is less than it could be? Are we afraid to ask for or expect more? Do we not think that if we sincerely asked God to produce in us a marriage that would honor and glorify Him that He would not honor that request? Here’s where it gets dicey. If my prayer is “Please change my husband/wife into the person I would have them be” it is highly unlikely that God will honor such a prayer. If my prayer is “Please change my husband/wife into the person that You would have them be” there is a somewhat better chance but not great. IF my prayer is “Please change me into the Godly husband/wife that You have called me to be” there is a good possibility that He will grant that prayer. Most likely it will not happen overnight. When God says in John 15:7 “If you remain in me and my words remain in you, ask whatever you wish and it will be given you” He is saying if you pray for something that is consistent with my Word I will honor that request. Why will He answer that prayer? Because verse 8 goes on to say “This is to my Father’s glory, that you bear much fruit…” Therefore if what we pray for ultimately brings glory to the Father it stands to reason that He will honor it. You might be saying, “Okay so God transforms me into the Godly husband/wife I have been called to be, how about my spouse?” My response – after you have been transformed, e-mail me and let me know if you see any changes in your relationship.